White Gloss Jewelry Gift Boxes sold in bulk cartons. Two piece boxes measure 8x2x7/8" and have non-tarnish cotton filler. 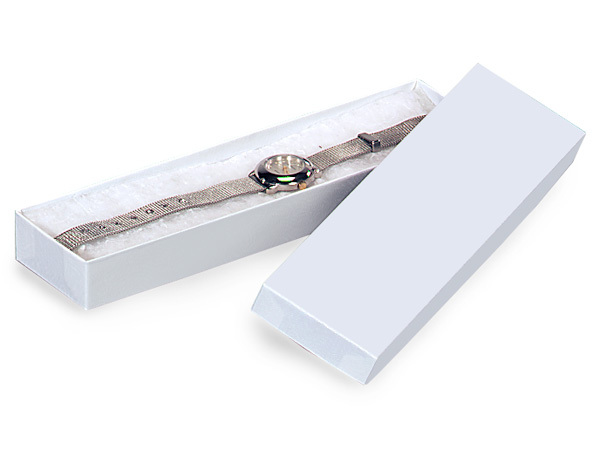 Nashville Wraps Jewelry boxes are made in the USA from USA materials. White Gloss Jewelry Boxes are high gloss two piece rigid setup boxes with non-tarnishing ultra white synthetic cotton. Jewelry boxes contain 100% recycled boxboard which is the largest component of the box by weight, does not include paper coverings. Paper coverings are 20% recycled. Available in many popular sizes and made in the USA.